Based in suburban Paris, Alexandre Touguet calls himself an “industrial and digital designer.” While his projects are ultimately physical objects and environments—ranging from furniture to consumer electronics to interior designs—Touguet is passionate about the use of digital tools to take clients from one end of the design process to the other: from the research phase to computer modeling and imaging to prototype production. Among his collaborative relationships: an ongoing association with perhaps France’s highest-profile designer, the prolific Philippe Starck. Is there a project you wake up every morning thinking about right now? I learned to control this over the years, but I remember when I started working, I was constantly thinking about some projects, from morning to evening. To be a designer is to be passionate, and it is true that it can be difficult to differentiate professional and personal life. Nevertheless, I think that we must know how to take breaks to be more productive in front of the blank sheet, and I force myself not to think about my projects outside working hours. When and how did you develop an interest in the arts? When I was young, my parents enrolled me in drawing classes that took place on Wednesday after school. As far as I can remember, I think I was comfortable with a pencil in my hand compared to my classmates. I was not very interested in painting, and my favorite drawing tool was always the gray pencil. I still remember the name of my teacher and he really contributed to my level and interest in drawing. Much of your work focuses on the home environment: furniture, architecture, consumer goods. Why are you drawn to that realm? I am interested in the products around us that we interact with every day and that have an intimate relationship with us—concrete things that can have a pretty direct impact on people. That’s what drives me to design chairs, electronic devices or interiors, [though] I don’t limit myself voluntarily to that environment. On the other hand, I also like when a client asks me about more exotic projects. I’m currently working on a medical product and I find this very interesting. What’s been your favorite design? I don’t know if we can prefer one design among others, because each design exists for a specific function. For example, it’s difficult to compare an eraser and a pen. It’s just as difficult to compare a chair and an armchair. Nevertheless, I really like the work of some designers who have been for me real revelations. For example, the work of Charles and Ray Eames in the 1950s is remarkable. They were at the origin of most types of modern furniture, without benefiting from current technologies such as computers. If I have to choose a model, I would say the Plywood LCW chair, a true work of art. Can you talk about how your work evolves from the research stage to imaging to prototyping? I think I have a fairly classic way of working. I start by taking note of the brief, and I learn about what already exists to understand the trends and attempts of other designers. I also try to understand why a product is a success or a commercial failure. I then take my pencil to sketch out some of the strong ideas I want to work on. Once I have the product in mind, I embark on the 3D model; that continues to fuel my thinking and allows me to go further in the creation and validate certain assumptions. Then, I continue my reflection on the materials and the finishes by realizing photorealistic synthetic images, which will be used to present my ideas to the customer. I then work in collaboration with my client and his engineering office to find the best solutions for manufacturing. All these steps are necessary for the realization of the prototype. It’s this last stage that makes me really vibrate, because during prototyping, the imagined product finally becomes real. It’s always a great moment. The modular Caddy Sofa System in the sketching stage. Caddy's stamp-joined, aluminum-tube base and zip-linked cushions, in the flesh. You have a long working relationship with Philippe Starck. Tell us about some of the fruits of that collaboration, and why you mesh well. Philippe Starck, although he is one of the most influential creators of our time, remains a person like any other. I think he is very attached to the relationship he has with his partners, and it is above all a story of feeling. Indeed, his experience in the business allowed me to understand things faster than by myself. It’s a kind of accelerated training to work with him. For example, I learned to be more precise in my drawings because he’s someone who likes precision and has a real attention to detail. I also had an opportunity to draw a coffee table for Kartell (Rae Orrgray), which was presented at the Salone del Mobile 2017. A great opportunity for me. When you look at what other people are making these days, who inspires you? The common point of good designers is to know how to draw a beautiful detail, a beautiful curve. The most inspiring are those who break free from social codes and who propose their own vision. I was very impressed by Ross Lovegrove or Zaha Hadid about 10 years ago because they really helped to change aesthetics in the collective unconscious of people with more organic forms. I think most contemporary designers have been influenced by their work, me included. More recently, I made the discovery of Jiyoun Kim, a promising young Korean designer whose projects I admire. 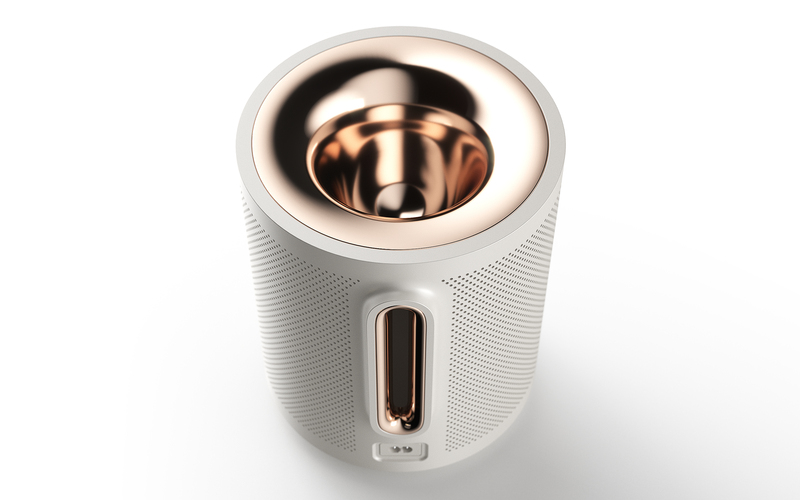 App-controlled wireless speaker—with golden insert and cup—skews minimal and sounds big. Does it come naturally for you to put your work out there? Sharing my work has almost always been natural to me. I remember that during my first year of design school, I was pretty modest about what I was producing and I did not particularly like to reveal my work to other students. I was mostly afraid of their judgment and negative reviews. But today I feed on these criticisms, and that’s what allows me to move forward, whether positive or negative. What’s on the horizon for Alexandre Touguet in the next year? Specific projects or collaborations you can talk about? Or new areas of inquiry? It’s been five years since I started to work almost exclusively with Philippe Starck. I learned a lot from him and I am very grateful to him. But this collaboration was also a hindrance to my personal productivity, because I didn’t have much time for other projects and other clients. I recently made the decision to give more time to other, more personal projects, on which I can fully express myself. So next year should be very prolific in new collaborations. I’m currently working on a very promising HIFI product in collaboration with a French startup and on furniture with a small French editor.